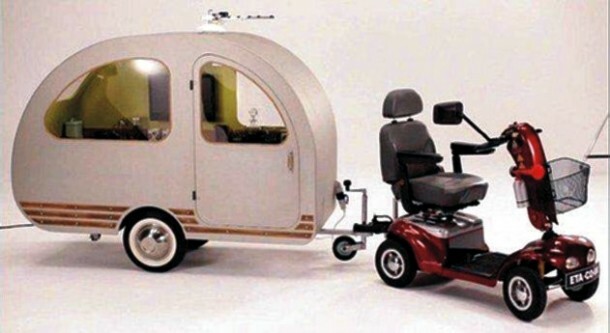 Now shoppers who in the past had to bring a sleeping bag to camp out at their favorite store to take advantage of those early bird bargains on Black Friday following Thanksgiving can rest in line in comfort in their new Shoppers Recreational Vehicle. Gone are the days of lawn chairs and thermos coffee to beat competitors to the newest fad toy or game before the shelves empty. The SRV is so compact that the driver can tow it behind their motorized shopping cart and load it up with all their goodies before heading home for a well deserved nap. Though the cart is not yet street legal, as it maxes out at speeds of 4mph, riders have been seen traveling in the lanes normally reserved for golf carts and bicycles. The only restriction to maneuvering in retail outlets is the cart driver must possess and AARP card.